Alas – we come to the final week of this years Goodwill Smackdown. We extended it a week so we could have a little more time to find items and sell them. Whether that extra time helped or not – we shall soon find out. If you’ll remember, each participant was tasked with finding a maximum of 3 items and needed to resell those items on ebay or Craigslist. The highest percentage of profit (on any of the items) would be the winner. Let’s find out what each contestant purchased and if they were able to sell their items for profit. Don’t forget to comment below for your chance at winning a $50 Goodwill gift card (OR another card of your choosing if you aren’t in a Goodwill area). 1.1 can she add to her first year victory? 2.1 Can the originator of the smackdown claim top honors? 4 Win a $50 Gift Card to Goodwill! can she add to her first year victory? Well, once again neither of my items sold. After my blowout first year in which I kicked Aaron and Charlie’s tails, and losing to Aaron last year, I fully expected a comeback this year. For my clothing choice I found a brand new, tags-still-on pair of Old Navy Jeans for girls. I got them on a “deal day” at Goodwill for half-price, paying just $1.99 for the jeans. I listed them on EBay using EBay’s recommended price of $9, but no bites. For my household item I found a beautiful-looking antique fake silver pitcher. I paid $4.99 at Goodwill and tried to sell it for $9.99, but again, no bites. I didn’t do auctions this year, but instead, set prices, hoping to solidify my profit margin. Apparently people are better lured in by the fast action of the auction bids. I’m going to try and re-list them via auction and see what happens. Either way, you can’t beat the great prices at Goodwill stores. Can the originator of the smackdown claim top honors? After I got the items home, I decided on selling the item that I liked the least.  (It’s not about the competition this year for me). 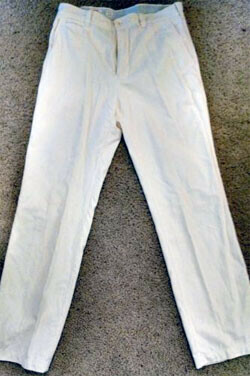 I listed the White Khaki Tre Vero pants for $8.99 auction with a fixed price of $19.99. The auction is scheduled to end on 9/30 at 3pm, and thus far I don’t have any bids, no watchers, but 9 views. As I’ve learned in year past that if I keep the item listed for at least 30 days, then every year I’ve sold my item for a profit. So at this point I’m doubtful that the item will sell, but I’ll be sure to keep you posted! After last years victory, I went into this year’s competition pretty confident (probably too much so). I decided to visit all the Goodwill stores in my vicinity and try and find that hidden “gem”. I think a lot of this is being in the right store at the right time – and being fortunate enough to spot that “one” item. It wasn’t until the 5th store that I was able to locate most of my items. Every year, I seem to find this challenge more difficult due to the fact that I think more and more people are visiting Goodwill stores these days because you can find a lot of good stuff – that is often brand new! At one store in particular, I could hardly find a parking spot because it was so busy with shoppers. Since it worked for me last year, I tried to seek out newer, popular board games. I settled on one called, ImagiNiff that I’ve played before and found to be enjoyable. I picked it up for $2.99 and listed for the same at ebay and a little more on Craiglist. In the end, it did not sell. For my second item, I also went old school and discovered an old wooden-shafted Robert T. Jones (Bobby Jones) golf club. Picked it up for $4.99 and listed it on ebay for as much. I figured if I could just get my money back (at the least), I’d be pleased. But for all my efforts, this too, did not sell. 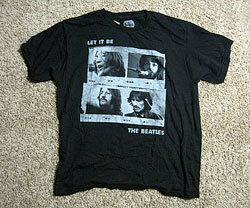 On my third attempt, I picked up a newer Beatles t-shirt that I thought for sure would get someone to bite. I bought it for $2.99 and started it at that price on ebay auction. I got quite a few visits to the page – and on the last day, just before the auction ended, someone swiped it for the asking price. Fortunately, I got a decent return on shipping and made just a little bit of money. Win a $50 Gift Card to Goodwill! As you can see – we aren’t exactly experts at thrift store flipping – but that doesn’t mean it can’t be done. I (Aaron) do know of people making a living off of flipping items on Craigslist and ebay. But it takes a fair amount of research, knowing what is valuable and properly listing the item for sale. I also think it’s important to set the prices low enough to get an auction going if you are selling on ebay. Oftentimes, I have set a price too high, and no one begins to bid. All this said – it was another fun Smackdown. Hope you enjoyed following along and we’d love to hear if you have tried this yourself and what has worked for you? All you have to do is leave a comment on this post OR the last one kicking off the event to be eligible to win the $50 Goodwill gift card (graciously provided by Goodwill Easter Seals in MN). Last day to comment is 10/2 at midnight. Congrats to Carol for winning the $50 Goodwill gift card! Thanks all who commented. I wonder if the local Facebook garage sale sites are becoming more popular to sell and buy things than eBay or Craigslist? I haven’t done this personally however they seem to be gaining a lot of traction and interest in my area. Good point Mandi.. never thought of that. It is always hit and miss for me when shopping goodwill. I haven’t tried selling things I’ve gotten there, as things I think will be great on ebay don’t seem to sell, and stupid stuff I think no one will want, does. I’ve recently discovered the clearance center at our goodwill – great for buying blankets for my dog to sleep on and ruin. I wonder if times are changing and the eBay/Craigslist sites are oversaturated. I haven’t been able to sell a mint condition iPhone 5C, either, which I think is ridiculous. Wow traveling to five stores to find merchandise Aaron you must be dedicated to this event. I frequently resell goodies that I find at garage sales and at Goodwill. But I mainly focus on antiques or vintage items, especially collectibles. My best hint is to search on EBay for your item and refine your search to list only Sold items. That way, you can get a good feel for pricing, frequency of sales, and whether auction or Buy It Now works better. What a fun time! Even though the profits were low I think it’s valuable for your readers to see the values that can come from non-traditional sources. As thrifty people know – every penny counts! Maybe next time the profits will be ridiculously high!!!!! Right now, it’s too much work for me to try “flipping” items, but as I clean out my closet, I first try to consign or get cash at resale stores. Those that I know aren’t worth the hassle – I donate right away. One thing I did find though, if you have something that is at first rejected, keep trying. I had a great Calvin Klein dress that didn’t fit me right. It didn’t sell on the first try, but did a month later – and it’s a store that will always buy for any season. The items I’m having the hardest time with are vintage items, which is where the internet and calling local stores helps to navigate those hurdles. Laughing, hey all of you really tried…Sometimes its just a item that stands out and catches your eyes..If your simply looking in clothing your missing a lot. No matter what your looking for there is always more to discover. fabulous tries you guys! You all are too nice. Don’t you just love the challenge?? Buying and trying to make a profit. I have found people seem to want the really weird items, I mean weird. Usually its hard to try to find something ‘off the wall’ because you think no one will want it, but you’d be surprised! Good job on trying and better luck next year!! Have bought a lot of stuff from Goodwill in the past. Currently, I am in the process of downsizing so I am trying to keep out of stores in general. There are a lot of good deals there though. I know several people who have bought stuff to resale. They don’t make a lot of money but sometimes you can really find some good bargains. Clothing Is something I never looked Into via auction sites, but perhaps I should check It out and see what I might be missing. I’ve never sold stuff via auction sites that I’ve bought second handed as I never thought It would even make a profit. Looks like I might be wrong about all that and should check out my Goodwill more often. It was fun to see the results of this contest. It makes me wonder though if shoppers are going to Goodwill (and other resale stores) instead of looking online? They are looking for the good deal locally? Also, with the “free” shipping that is available on so many sites is the idea of shipping costs hurting some of the sales? Looking forward to next year’s competition. Try some Christmas animated items if you get the chance. A few years ago I bought 2 of them for around $4.99 and you will not believe this but 2 people competed to win the one. It sold for over $200 on ebay.I think just because each buyer didn’t want the other to win. The other sold for about $90. So both were excellent. While we’re in the “don’t quit your day job” kind of returns, it’s fun to see what you guys do with this challenge. I might have joined had I understood more of what it entailed. If you do it next year, how about a primer on what to do and results from previous challenges? Thanks for the suggestion Kent – will certainly keep this in mind! I was too – but maybe there are more in the game? OR we listed poorly. Good job everyone – just not the year for flipping items.